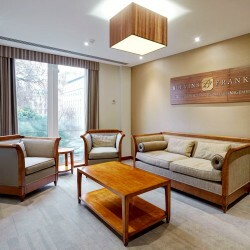 Blevins Franks Financial Management provides tax, wealth management and estate planning services to private clients in the UK and around the world. With major offices across Europe, their London office moved to 28 St James’ Square in 2012 occupying two floors. Rapport Solutions were commissioned to resource office design services and manage a tender procurement process for all fit-out works. Our client required a high-level specification that would establish Blevins Franks at the forefront of their specific market. The final result has awarded many compliments from clients and staff.